Often referred to as the first dog of America, the Xoloitzcuintli temperament is happy and adaptable. 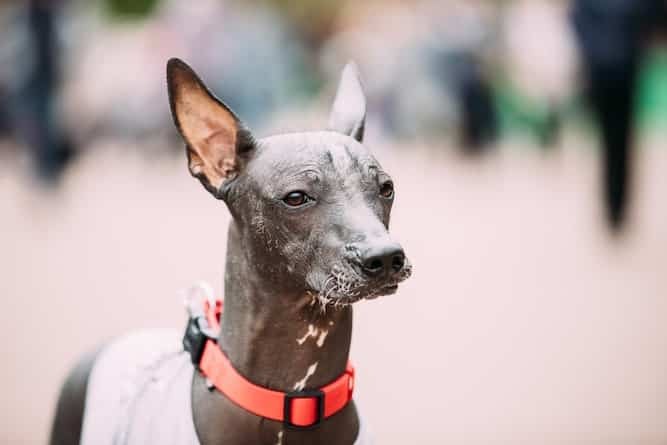 The Xoloitzcuintli pronunciation is “show-low-eetz-kweent-lee” but you can call them the “Mexican Hairless” or “Xolo” dog. Xolo’s have been around for many years – about 3,000 to be exact. They have been depicted on pre-Columbian pottery along with reports from Spanish conquistadors. The Xoloitzcuintli’s history includes being prized for their healing abilities. These warm-bodied dogs were known to help with anything from insomnia to toothaches to asthma. They were even known for warding off evil spirits. Xoloitzcuintli’s were popular during the 1930s and 1940s. They were often found in the works of Diego Rivera and Frida Kahlo. Though they dipped in popularity shortly after, they recently made a comeback – being re-recognized in the American Kennel Club in 2011. Xoloitzcuintli dogs are highly adaptable. This is a breed that adapts well to many different lifestyles. Xoloitzcuintli temperament is happy, loyal and incredibly smart. This affectionate breed loves nothing more than cuddling with you on the couch. They do well in a home where they are included in a lot of activities – but the Xolo does tend to latch on to one person in the family. Some people consider the Xoloitzcuintli needy as they will likely become destructive if they feel left out. They don’t do well when boarded or left in another person’s care. The Xoloitzcuintli can be cautious and reserved with strangers but they are not timid. They take their time getting to know guests and will decide for themselves whether they like them or not. The Xolo does not like to be touched by strangers, either. Xolo’s make excellent watchdogs and will let you know if they see something of concern. They are not nuisance barkers, though. Xoloitzcuintli’s can be territorial towards other animals. If they are not properly socialized, they can become aggressive towards other dogs or humans. The Xoloitzcuintli is a sensitive breed and does better in a home with older children. They also do well with other pets – including cats – when raised with them. Xoloitzcuintli’s are quick learners –, especially with housetraining and obedience training. Negative or harsh punishment does not work on this sensitive breed. They respond well to positive reinforcement training. Make sure you provide a lot of praise, food, and play rewards. Xolos do need consistent training with defined boundaries, though. Begin training Xoloitzcuintli puppy as soon as you bring them home. Xolo’s can be an escape artist! Be sure you have a secure fence in your backyard or you may need to train him out of that tendency. If you are ready to find your perfect Xoloitzcuintli, check out the Xoloitzcuintli Club of America. Here you can find everything from the breed history to a breeder directory to Xoloitzcuintli rescues. A Xoloitzcuintli for sale will cost around $600-$800. The Xoloitzcuintli price depends on your location, litter availability, and lineage. The more superior the lineage, the more expensive the Xolo will be. Looking for a Xoloitzcuintli available for adoption? Xoloitzcuintli adoption is right for you if are in the market for an adult Xolo or perhaps a Xolo with special needs. Adopting an adult Xolo can be beneficial as they are typically already housetrained and trained. Essentially, they are out of that pesky puppy stage! The rarity of the breed makes them scare in local shelters but there are dedicated Xolo rescues. 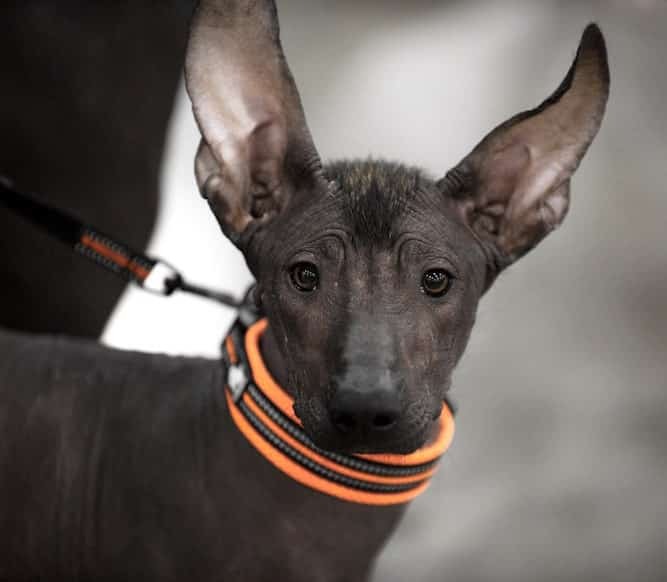 The Xoloitzcuintli Primitive Breed Rescue is a great resource for finding a Xoloitzcuintli dog available for adoption. Finding a good Xolo breeder will require time and research. Xoloitzcuintli breeders should know everything there is to know about the breed. For example, they should know the breed's temperament, and health issues. When choosing a breeder, arrange to make visits to several different ones. You’ll know the breeder is reputable if they are able to answer all of your questions and ask you questions in return. Although a lot of reputable breeders have websites, red flags include multiple litters at their house, puppies always being available and if you are able to pay online with a credit card. 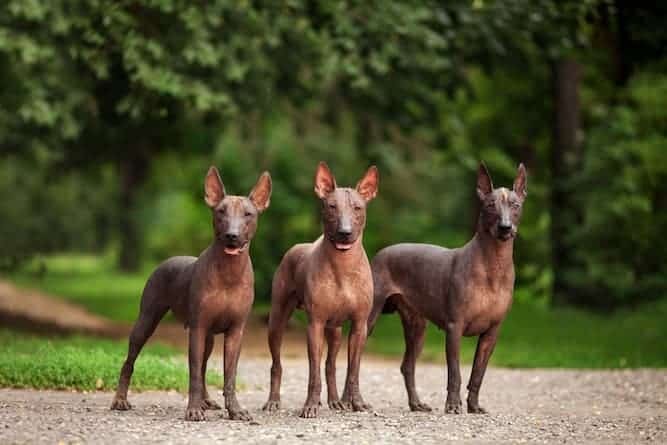 Do your research and you will surely find the perfect Xoloitzcuintli breeder. Toy – Toy Xolos weigh around 10-15 pounds are around 10-14 inches tall. Miniature – Miniature Xolos are between 15-30 pounds and 14-18 inches tall. And Standard. – Standard Xolos are between 30-55 pounds and between 18-23 inches tall. The average Xoloitzcuintli lifespan is between 13-18 years. 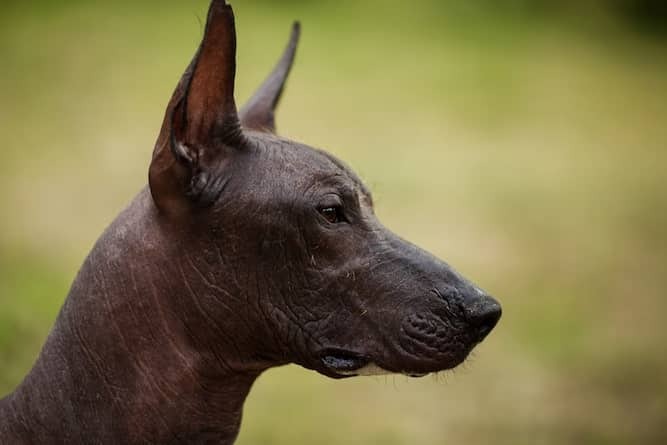 In addition to coming in three different sizes, the Xoloitzcuintli comes in two varieties: hairless or coated. A coated Xoloitzcuintli has a short coat as opposed to the hairless Xoloitzcuintli. Coated Xoloitzcuintli’s only require occasional brushing. Younger coated Xolos can suffer from adolescent acne and may need special care. Occasional baths are also necessary to keep them clean. Hairless Xolos will require sunscreen if they will be in the sun for long periods of time. And, because there are hairless Xolos, they require protection from the sun and cold weather. Use sunscreen when in the sun. In the winter put a sweater or coat on your Xoloitzcuintli to keep them winter. The Xoloitzcuintli is a fairly active breed. They love long walks and games of fetch in the backyards. But, they are famous for being calm while inside. Xoloitzcuintli puppies need quite a bit of exercise and playtime to keep them happy – and out of trouble. Whether you choose a hairless Xoloitzcuintli or Xoloitzcuintli with hair, be prepared to be stopped on the street. These striking dogs are unmistakable and are sure to turn heads. Xolos are an adaptable breed that will shower you with affection. They are quick learners and make excellent watchdogs. As long you have love to give, the Xoloitzcuintli will be a lifelong companion.